Dr. G, is an Endodontic Specialist, a celebrity Endodontist turned winemaker! Dan Aykroyd, Francis Ford Coppola, Mike Weir, Jim Cuddy and Arlene Dickinson just to name a few… what have they all in common? It seems celebrities from all walks of life are becoming smitten with the vine! The wonderful world of wine is capturing the hearts and drawing in the big bucks of many around the world. All of the aforementioned and so many more have acquired a stake in the wine business, of varying degrees. 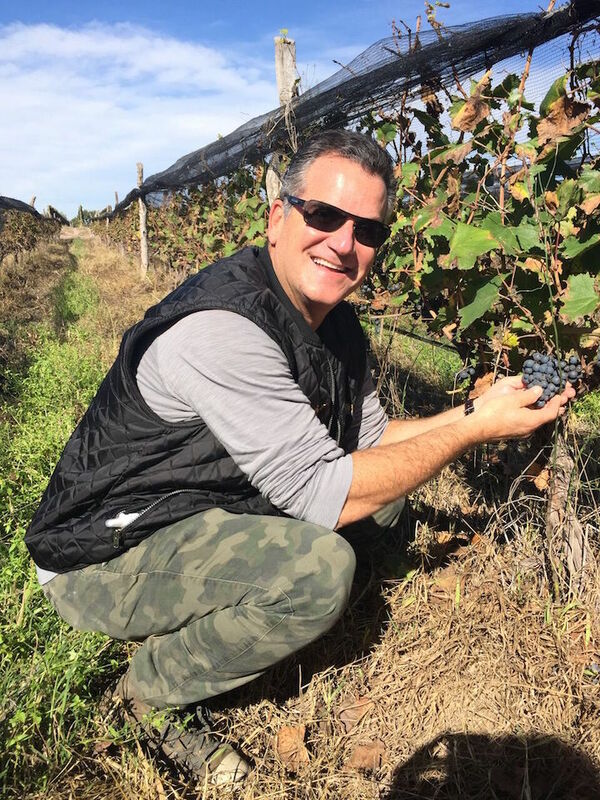 Whether simply as an investor, lending their name to a wine or becoming intricately involved with the entire process from the vineyard to the winemaking to the marketing as is the case with Jim Cuddy of Blue Rodeo. This ancient beverage dating back to 4100 BC is it! But hold on, this is not the domain for the celebrity alone. Many a folk do succumb to the allure of this delectable beverage and are giving into their passion for wine. Doctors, lawyers, politicians and bankers to name a few. We’d like to introduce you to one such wine aficionado who we happened to meet over five years ago whilst both of us being interviewed for the publication PIE Magazine. At this time Dr. Gary Glassman’s passion for wine was already in full bloom! Dr. Glassman, aka Dr. G, is an Endodontic Specialist, a celebrity endodontist ironically, who when not with patients at his practice in the heart of Yorkville, travels the world lecturing on his specialty and the merits of maintaining excellent oral health. With his enjoyment of fine wine intensifying with every new discovery in the bottle, it ignited in Dr. G a thirst to further explore, learn more and somehow become a part of this exciting world of wine. And so the journey began with serendipity knocking on the door in the year 2014 at which time ‘The Wine Guys’ and their wines under the label Los Flâneur were founded. It began with two fine gentlemen residing in Buenos Aires who loved spending time in Mendoza, Argentina. Argentina,the mecca for Argentine wine and what came to be Argentina’s signature grape Malbec. 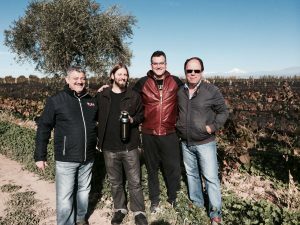 Argentinian Café owner Hernan Bal already in the wine business joined together with friend and entrepreneur Steve Jones, a fellow Canadian, to seek out a possible vineyard site to purchase. To their astonishment they located a property beyond their imagination, right in the heart of the “Tierra de Malbec” Lujan de Cuyo, Mendoza where wines are known to be rich and complex due to the elevation and particulars of the soil. Recognizing the scope of the project and need for help in both financing and management, as Hernan says “so we brought in the two people we most enjoy spending time and drinking wine with, Gary Glassman and fellow Argentine Enrique Gedikian. “ Fast forward to the present, Dr. G shares with us a few more details on the storybook tale of the realization of one of his dreams. ‘The Wine Guys’ and their wines under the label Flaneur were founded. At the foothill of the Andes, in Luján, lies the home of some of the oldest vineyards in Mendoza. Wines from this region are exuberant and structured. Vineyards surround Perdriel, in the Southern bank of Mendoza River, north from Agrelo. Altitude is one of the most relevant elements of wines from Perdriel, vineyards grow at 970 metres above seal level. This means they receive intense sunlight. In Perdriel prevail loamy soils with gravel and clay over a foundation of stones at the riverbed. They drain easily, causing vines to develop deep roots in the search for water. Given the poorness of the soil, vines are forced to put their effort into creating berries with low water content. This results in rich and complex wines that have firm and structured tannins. We schedule a late afternoon meeting with Dr. G at his dental practice, “make sure you have samples and wine glasses” we declare.When we enjoy the opportunity to sit with Dr. Glassman, have a chat and share a glass of Flaneur his enthusiasm is contagious. We learn that Vinedo los Flâneurs is a four hectare vineyard located on picturesque fertile land on which the four partners decide to take on the challenge of growing 1.5 hectares of Chardonnay and 2.5 hectares of Malbec grapes vines. In that first year Gary explains, ‘the planted vineyard produced a bumper crop and when the grapes finally matured the vinification process began.’ How exciting for this wine aficionado to see his very own grapes slowly mature, each day growing closer to what eventually will produce a wine awarded 91 Points, Best of Argentina 2017 Report by Master of Wine Tim Atkin! We sniff, we swirl and we enjoy together this celebrated Single Vineyard Reserve Malbec 2014 with rich fruit flavors, hint of spice and smooth tannins, got to love this Malbec, and what ‘s this? Gary now presents to us a second Flaneur Single Vineyard Reserve Malbec 2014, looks the same, the bottle, vintage, single vineyard…”not so” says Dr. G. Not able to contain his excitement Gary tells us that this Malbec, is produced identically to the one we just enjoyed, the sole difference being that the grapes were sourced from a vineyard at an altitude of 1170 meters rather than 970 “Take this Malbec home, let me know what you think”, how fascinating to see how a wine may differ simply due to a 200 meter difference in altitude. You will be amazed.” Awesome, we’re excited to taste and eager to report back our findings! Two Malbecs, the same vintage the difference is the altitude the grapes were grown in. As we bid adieu, Gary offers us a goodbye or so long for now parting gift, “don’t forget the bubbly”. We are reminded of the great benefits the positioning of the vineyard and the specific terroir this affords the grapes, both for the Malbec and the Chardonnay. This sparkling wine was produced from the 1.5 hectares of Chardonnay, it is a Blanc de Blanc (100% Chardonnay) and was once again awarded 90 Points! Produced in the traditional Champenoise method, Gary enthuses the Elisabeth Brut Nature 2014 offers up tropical fruit aromas with a delicate acidity, enjoy with lobster or truffle popcorn! Wow, now you’re talking! Dr. Gary Glassman and his partners are thrilled that their wines have finally arrived. Available in Ontario market through Da Capo Wines. Follow Dr. Gary Gassman on Twitter and Instagram. Listen to Dr. Gary Glassman on the Audio Podcast here. 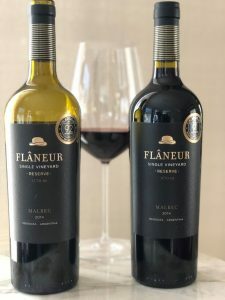 Flâneur Single Vineyard Reserve Malbec 2014 $22.95/bottle Our first taste of Flâneur was the Single Vineyard Reserve 2014 produced from vineyards planted at an altitude of 970 meters. The wine is deep red and intense in colour with a flight hue of purple. The bouquet offers up rich dark red fruit, hints of violet and licorice with seductive bright blackberry, plum and notes of spice on the palate with smooth tannins. Upon tasting our second bottle, the difference in altitude at which the grapes are planted (1170 meters) produces a very similar Malbec. Many of the delights are echoed only with slight differing nuances such as percentage alcohol being slightly higher, and flavour concentration slightly more intense. Both are delectable!